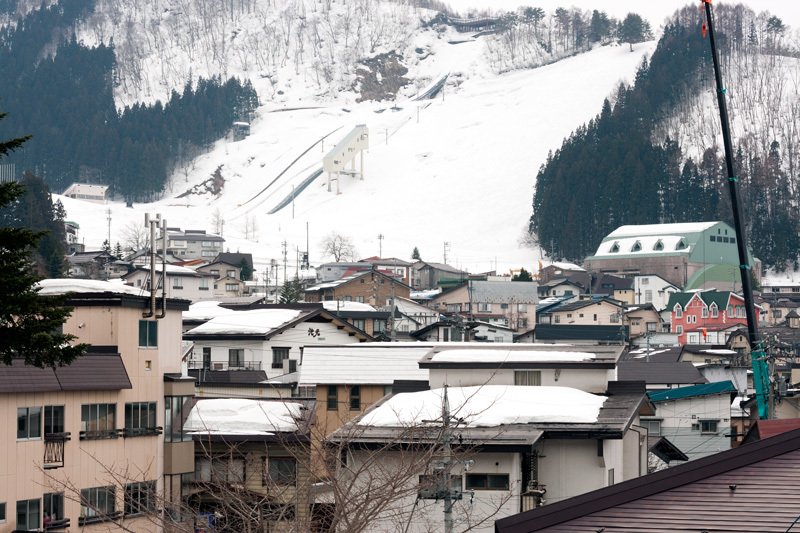 Nozawa Onsen on the edge of Kenashi mountain (1,964m) remains a traditional Japanese village that is located north of Nagano, a couple hours’ drive from Tokyo city. It is also only 30 kilometres from the ocean and this rather unique position is a hot zone for heavy dumps of snow. 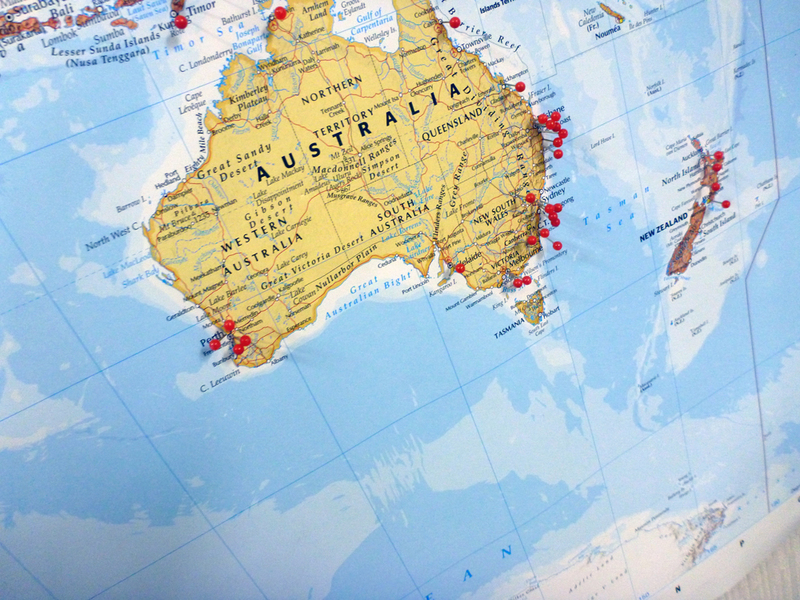 We travelled all the way from Australia for the ski season which runs from December to March each year. 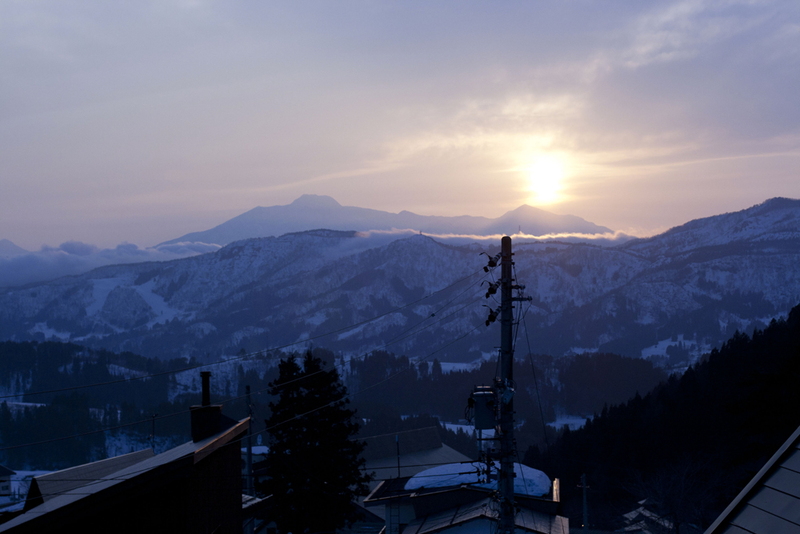 The village is quiet and minus an après–ski party scene, instead there are natural onsens to soak in at night and steaming hot Oyaki dumplings to eat. There are a couple of western run accommodations but for the most part the businesses are run by the locals. 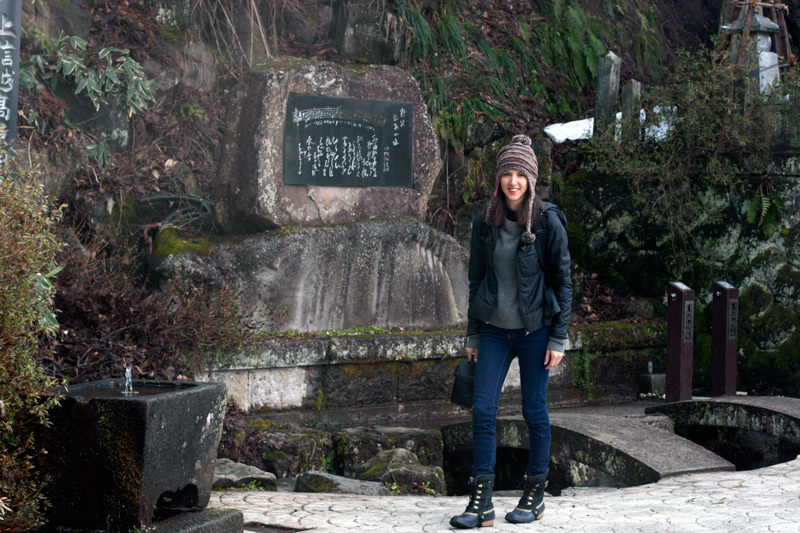 We spent the first couple of nights at Shirakaba, a traditional Japanese and family managed guest house. One of the sons runs the ski hire shop on the Hikage slope. 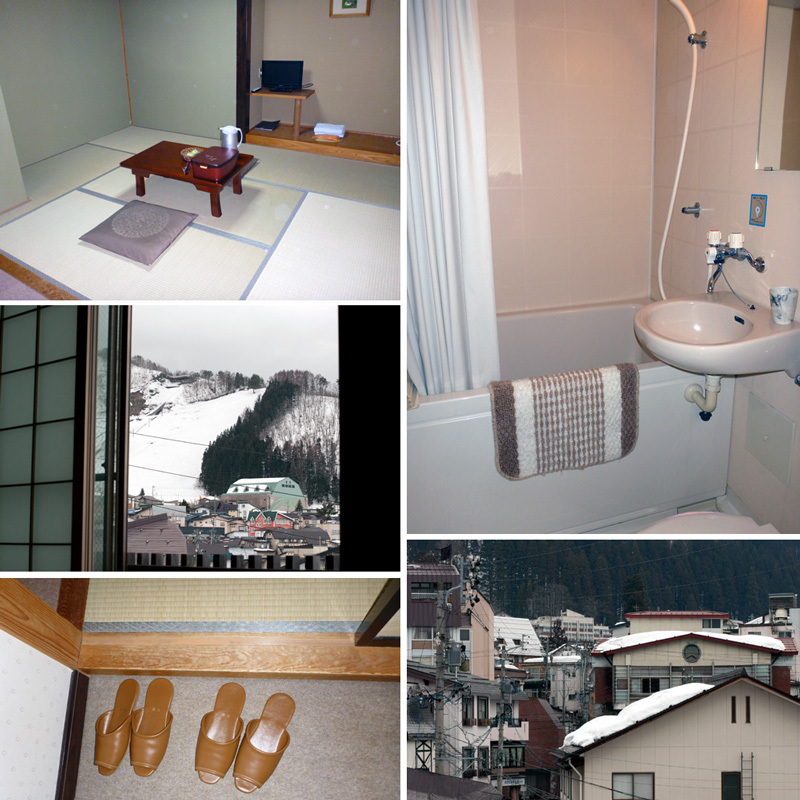 We booked a Japanese style twin room with a private bathroom through the bookings.com website. We arrived late in the evening to an empty street but the warm amber light was still on at the guest house. The mother and daughter greeted and took us to our room, leaving the orientation for the next morning. After our sleepless 24 hours in Tokyo we were looking forward to a good nights rest! Our room on the second floor was one of the simplest rooms I have slept in. An entrance to leave our slippers (shoes were left behind at the reception area), bathroom with a small but deep bathtub, a powerful gas heater, television that broadcast Japanese shows over a fuzzy reception. The futon bedding was stored in the cupboard. The large window gave us a lovely view of the village and mountain, only to be seen the next day. Dk and I sat on the tatami floor drinking the hot matcha tea that was waiting for us on the small wooden table. 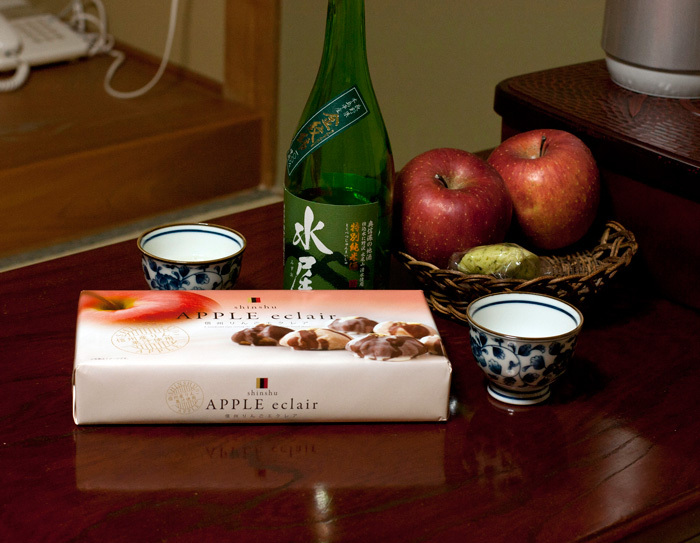 Afterwards we opened a bottle of sake and ate some wagashi (Japanese sweets) we had bought from the Nagano train station. Sleeping on the futon was an experience with its many layers of blankets and materials. I would fold and store it all in the cupboard each morning and every evening lay it out after our showers. It was a bit of a process but we had no qualms about the traditional futon. Following a full day of skiing and returning with bellies full of food we would drift into an instant deep sleep as soon as our heads hit those rice pillows (yes our pillows were filled with rice). The room was warm thanks to the powerful heater. The next morning we made our way downstairs, the daughter hearing our voices came out from the office area and greeted us. She pulled out the town map and circled places of interest, more importantly where we could buy ski passes and hire equipment. 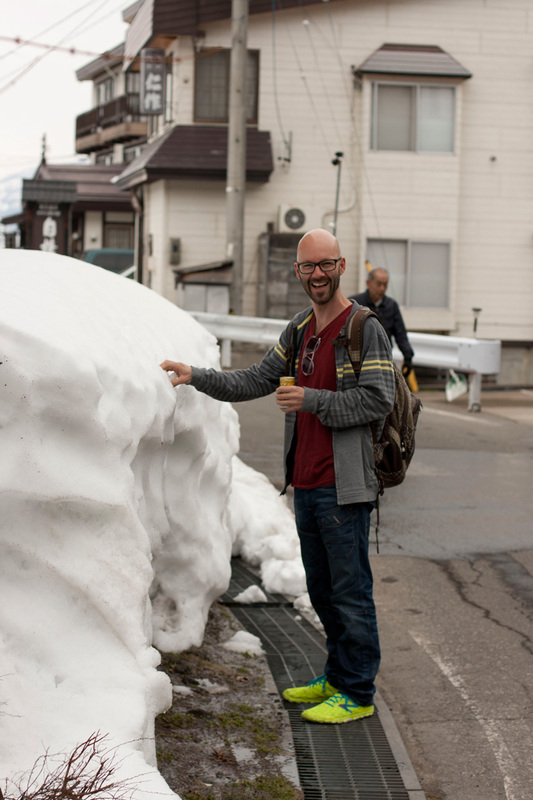 We wandered around the village and were stunned at the high snow walls, they were much higher in the middle of winter and were melting with spring approaching. 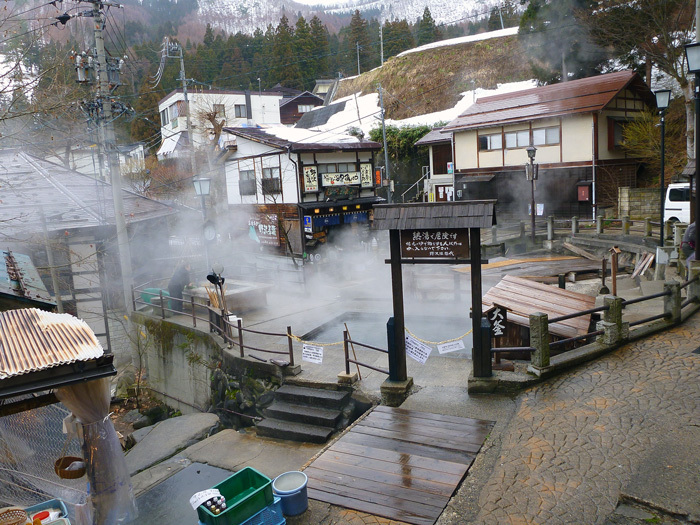 The town has a number of public hot spring baths known as onsens, a place to soak in the natural hot mineral rich waters – naked!! More about that rather enrichment experience later! 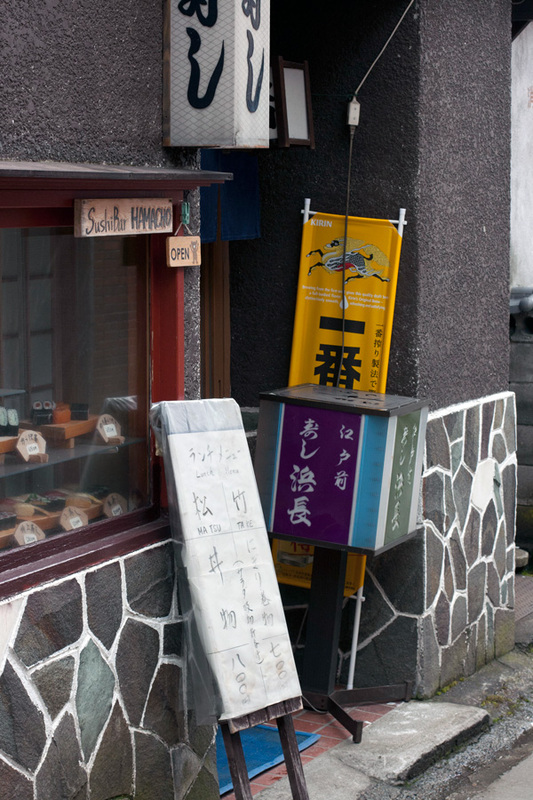 In the town centre there is a place called ogama and it is not for bathing. 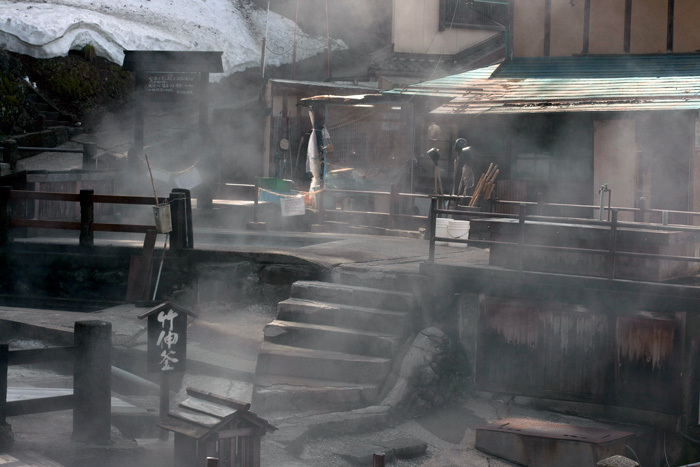 The 90 degree water is used for boiling vegetables and onsen eggs. The water surfaces through the rock into a stone basin. The ogama is off limits to non locals but you can certainly look on from a safe distance and take photos. Most of the roads in the village are curved, winding around the houses and a nifty little thing is they are also heated, making walking a breeze during wintertime. I noticed many of the cars to be smaller than my little car back at home. 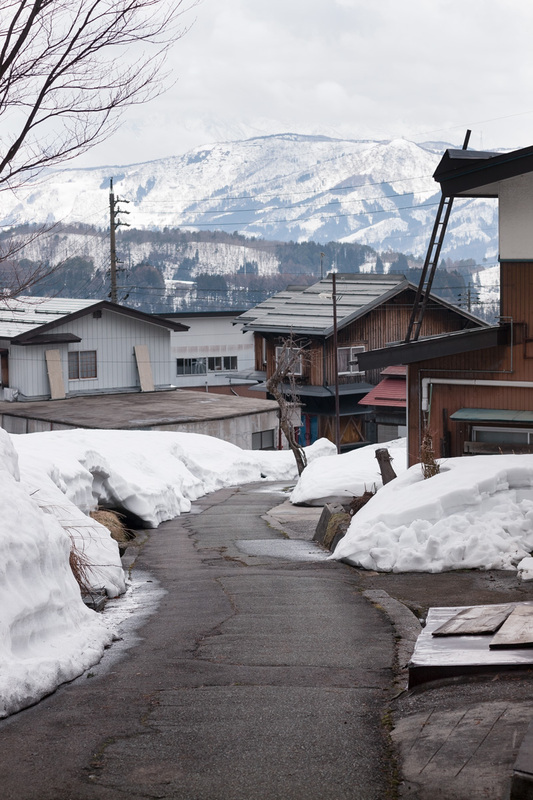 The roads are incredibly narrow at some spots and a Range Rover from Tokyo city looks oddly out of place in Nozawa. Shirikaba is located in the town centre and close to food. 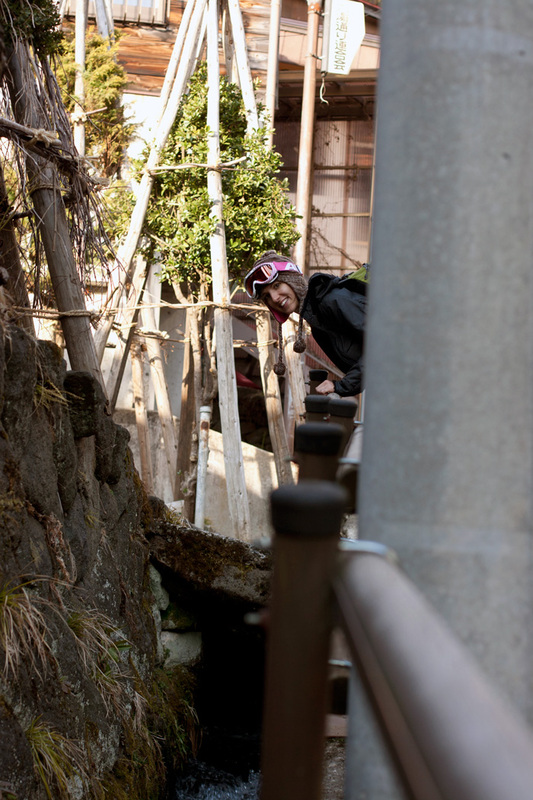 It is about a 10 minute uphill walk to the Hikage ski lift/bunny slope and on the way you will pass the onsen houses. The village is small and no matter where you stay you’ll never more than a 15 minute walk away from anything. The village is built on a slope, it is an steep uphill walk to the ski lifts but after a hard day in the snow it is a downhill return. To the side of most of the roads is a purposely built channel where crystal clear water from the mountains rapidly passes through the village to reach the Chikuma River. Beware at night! I was curious and obsessed with this, especially the constant sound of rushing water, it was a beautiful sound. Water is a wonderful resource and to hear it everyday is not something I experience back in Australia! 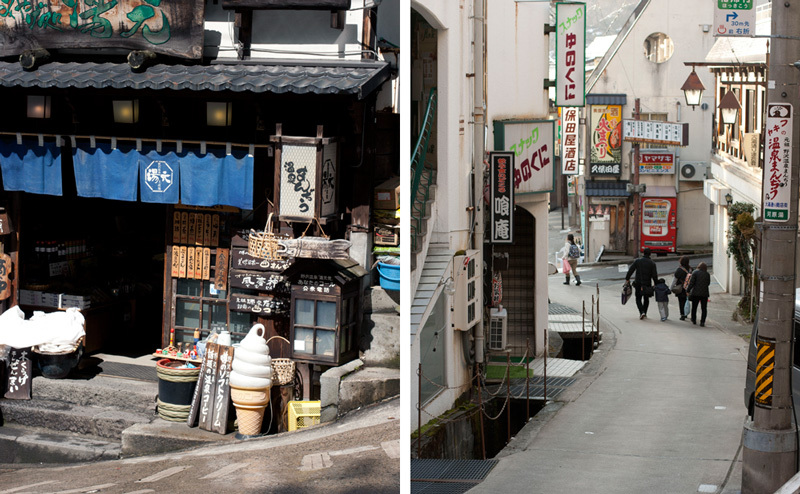 There were three wonderful eateries a 5 minute walk from the accommodation. 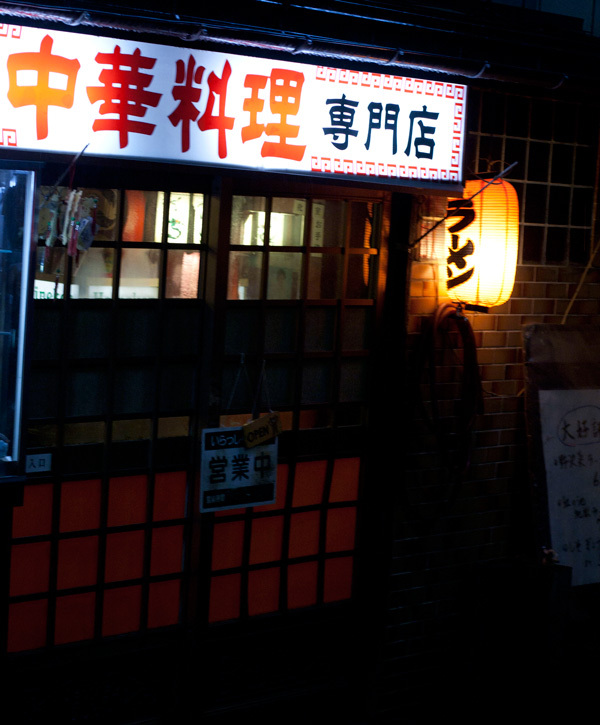 We returned a couple times to this tiny sushi bar, they offer an english menu and it is reasonably priced. The best seats are at the bar, watching the sushi master prepare the sushi and sashimi. The sushi is absolutely delicious and starts at 1,000 yen for a set. I wrote a little more about our experience at Hamachozushi and you can read it here. 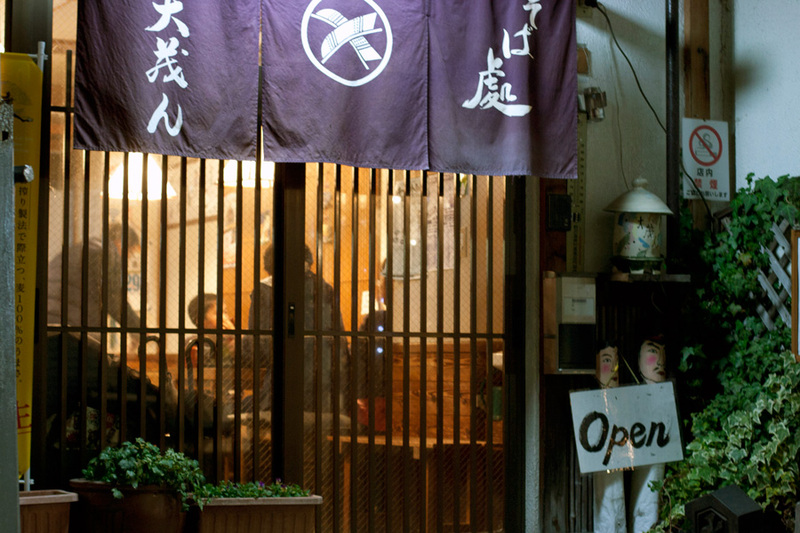 This small one room restaurant is run by a husband and wife team, the Daimon family have been making buckwheat soba for many years and this husband and wife team stand as the 3rd generation. What a treat to be able to enjoy food recipes passed down through the generations. The menu offers a choice between udon and soba noodles. I had the soba noodle served in a soy sauce based broth and topped with a delicate prawn tempura and egg. Dk had the tempura set which was served with soba noodles and a side of tempura. The food and sake is cheap, the portions large. We had a great evening at Soba Daimon. This was our first evening meal in the village, we had returned from skiing to realise that the town became very quiet at night. We stopped at the first place we saw which was Wanryu. Ramen in winter is a comforting meal. I had the pork ramen (850 yen) and Dk the spicy ramen (700 yen). Delicious noodles in a rich broth, my pork was tender and flavoursome. Our stay at Shirakaba felt like we were staying at a close friend’s home, it was comfortable, clean and offered a welcoming environment. I wish I could speak Japanese as I felt I missed quite a bit of information, lost in translation when trying my very best to communicate with the family. Also a reason behind me writing this post, I wanted to share my positive comments about staying at Shirakaba. It was a memorable experience for me. There is nothing western about Shirkaba and that is exactly what I was looking for. 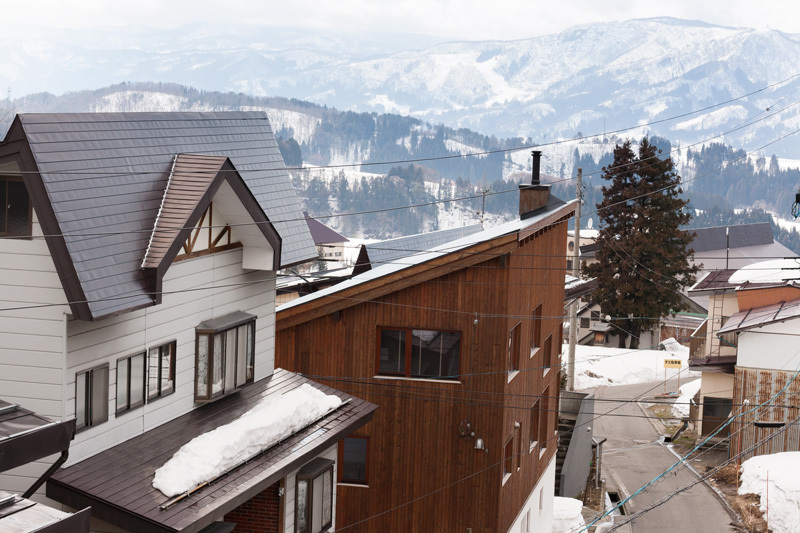 Following our time at Shirakaba we did move closer to the ski lift staying in a western apartment for the last two days of the trip which I will write about soon. 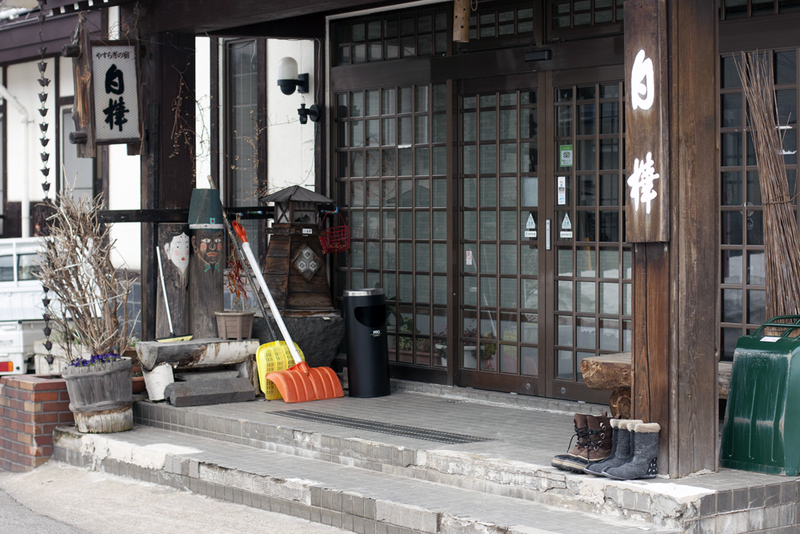 Guests staying at Shirakaba observe the traditions such as leaving your shoes behind at the door and wearing one size slippers. You should not wear the slippers on the tatami mats. There is a vending machine in the entrance. A bottle of water is 300 yen and an Asahi beer is 350 yen. The lobby has free wifi wireless internet and it is fast! The hotel sells ski passes and provides a drying room for ski equipment. 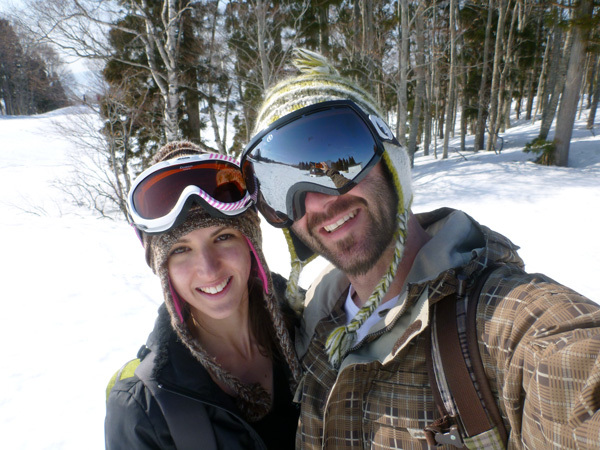 Guests receive 30% off rental ski or snowboard hire.. 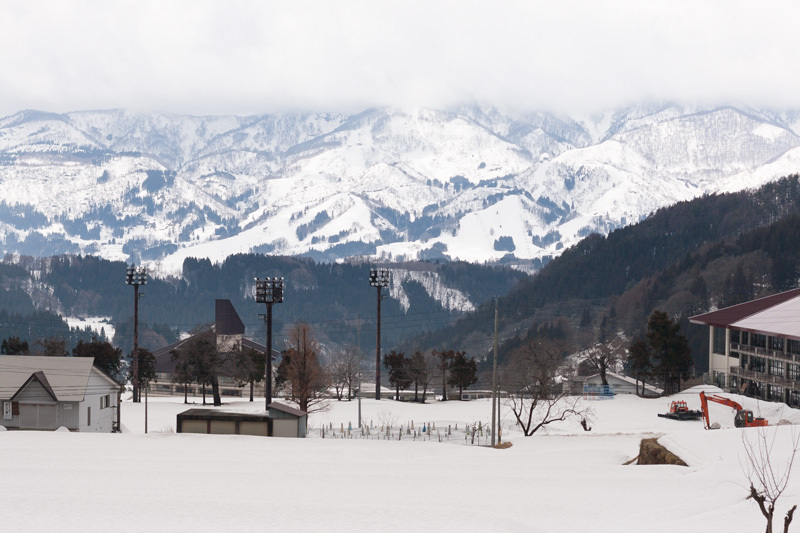 The ski hire store is located in the basement of Mos Burgers at the Hikage Ski Lift. Guests can leave the ski gear in the store each day when returning from a day of skiing. There are toilets, change rooms and storage lockers. Because I have the dorkiest non waterproof ski pants I got changed each time. This was handy we could go and eat straightaway rather than go back to the accommodation.